It is such a joy knowing Benita, and this month we get to celebrate her as the Volunteer of the Month at Leonard Terrace. Benita has been helping out since our dining site opened, about two years ago. She is there every day, helping with a variety of tasks like, serving meals, getting refreshments for birthdays and bingo, and driving people to the doctor or to get a prescription. She has even DJ’ed a dance party for the residents and put on a ‘breakfast get together’ in the time she has lived at Leonard Terrace. Benita was born and raised in Grand Rapids and two of her eight siblings still live nearby as well. Before she retired, Benita spent some time as a receptionist, then worked in management for 12 years at the Breton Blimpie’s, where they sent her to the community college to get her culinary certification. She then went on to work at Calvin College’s dining hall for 9 years, where she had a great experience and met people from all over the world. Benita also rescued a dog named Otis recently, and has cared for him for 18 months now. Benita was raised in the church and has remained very involved in the church and has a strong desire to help and care for others. She values family greatly and spends as much time as she can with hers. She visits with her two sisters that live nearby often, as well as with her daughter and 11-year-old grandson. 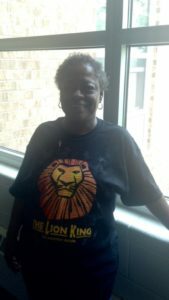 Benita says she loves, “helping people and meeting people and getting to know them, and they get to know me too. I enjoy having positive conversations with people and pray for them when they need someone to.” Benita is very active in the Leonard Terrace community and beyond, everyone knows Benita and she is always doing something, and she likes it that way. She says she feels such joy when she helps people and cares for people, and that is the mark of a true volunteer’s heart. Yet another task she organizes, is when another resident is in the hospital or has passed away, Benita starts a collection among the other residents for a memorial or flowers/plants or any type of representation for that person and personally delivers it to them in the hospital or to their family. And it’s gestures like that, that make Benita such a positive person to be around. We are so thankful for Benita’s commitment to our program and so grateful to have her as a part of our team. We appreciate her, and others like her who give so generously of their time to reach homebound seniors in our community. Thank you, Benita!